Gypsum, or hydrated calcium sulfate, is softer and less dense than anhydrite, or anhydrous calcium sulfate. 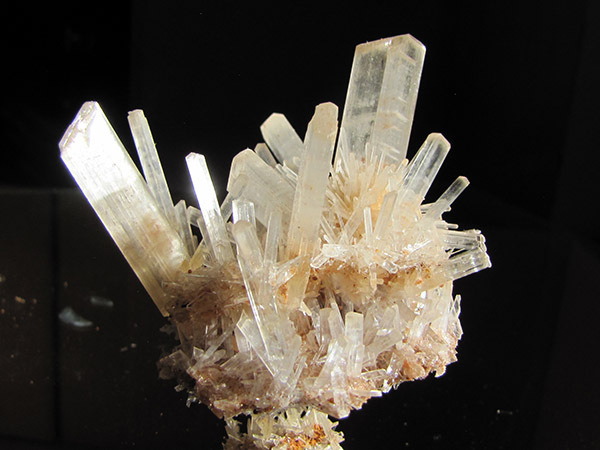 Most collectors are familiar with the minerals gypsum and anhydrite. Both consist basically of calcium sulfate. The difference is that gypsum (CaSO4·2H2O) is a hydrous mineral with two attached molecules of water. Anhydrite, as its name implies, is an anhydrous mineral with no attached water molecules (CaSO4). Gypsum and anhydrite are textbook examples of how attached water molecules, called “water of hydration”, can affect such physical properties as crystal structure, density and hardness in minerals that have similar parental chemical compositions. The asymmetrical configuration of water molecules, which consist of large, negatively charged oxygen ions covalently bonded to two small, positively charged hydrogen ions, explains their ability to attach to other molecules. Because the two hydrogen ions are grouped together, they retain a weak positive charge, while the opposite side of the water molecule, dominated by the large oxygen ion, retains a weak negative charge. This atomic arrangement with its opposing charges enables water molecules to act as tiny dipole magnets that can attach themselves to other molecules through the attraction of hydrogen (polar) bonding. Hydrogen bonds form when the faintly positive poles of water molecules attract the negatively charged electrons of other atoms. The attached water molecules are electrically neutral and do not affect the electrical balance of the parent molecule. In gypsum, the positive poles of water molecules are attracted to the slight negative charge of the oxygen ions in the sulfate radicals. Because hydrogen bonding is strongest at cold temperatures, gypsum becomes unstable when heat destroys its weak hydrogen bonds and drives off its water of hydration. Whether calcium ions and sulfate ions will crystallize from aqueous solutions as gypsum or anhydrite depends primarily upon temperature, and to a lesser extent on pressure and chemistry. In low temperatures and the presence of available water, anhydrite can hydrate (or rehydrate) and convert to gypsum. Conversely, in higher temperatures and the absence of water, gypsum can dehydrate into anhydrite. Gypsum is by far the more abundant of these two minerals, because water and calcium-sulfate molecules have a stronger mutual attraction at ambient temperature and pressures. While both gypsum and anhydrite are basically calcium sulfate, the presence or absence of water molecules makes a big difference in their physical properties. At Mohs 1.5-2.0, gypsum is much softer than anhydrite (Mohs 3.0-3.5). The reason is that gypsum’s attached water molecules increase the distance between its calcium ions and sulfate ions, weakening the strength of its ionic bonding. Increased inter-ionic distance also decreases density, so gypsum’s specific gravity is only 2.32, while that of anhydrite is substantially higher at 2.97. Water of hydration also impacts crystal structure. Anhydrite crystallizes in the orthorhombic system, but gypsum crystallizes in the monoclinic system. And while anhydrite can hydrate into gypsum, gypsum can dehydrate into anhydrite. Therefore, these two minerals often form mutual pseudomorphs, with gypsum exhibiting the external orthorhombic shape of anhydrite and anhydrite exhibiting the external monoclinic shape of gypsum. An interesting side-by-side example of these two forms of calcium sulfate is the blue angelite gem variety of massive anhydrite. It has a very fine grain, slight translucency, and a pleasing color caused by traces of divalent iron. Angelite, which occurs as nodules in altered limestone, has been found only in Peru. When the anhydrite on the surface of angelite contacts groundwater, it hydrates and converts to gypsum, losing both its traces of iron and blue color. The result is a snow-white rind of soft gypsum surrounding a harder nodule of blue anhydrite.